Flipkart co-founder Sachin Bansal, also a strategic investor in the electric vehicle company Ather Energy, is India’s first celebrity owner of the recently launched Ather 450 electric scooter. Just days ago, Bangalore-based electric mobility start-up Ather Energy began delivering the first batch of Ather 450 electric scooters. 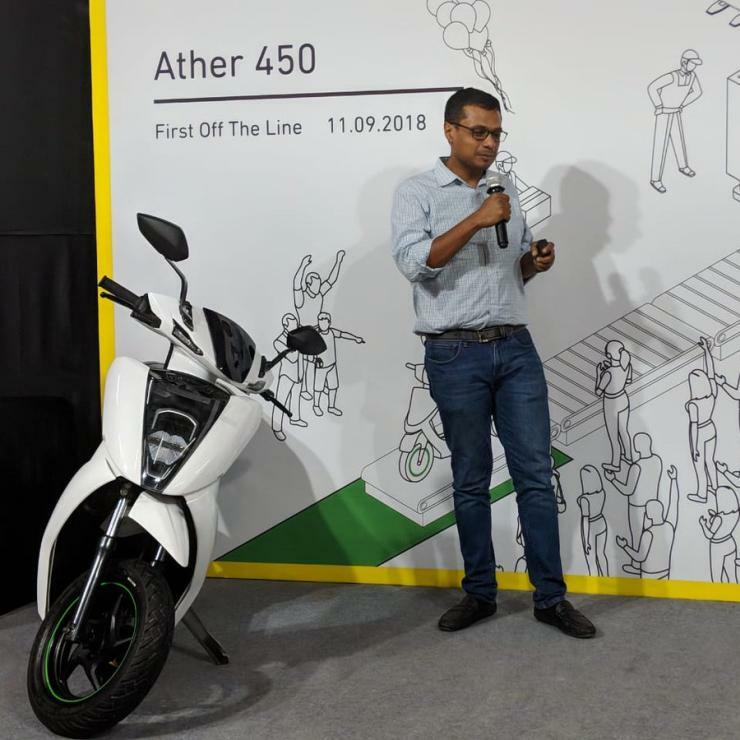 Ather Energy had invited select customers to its factory at Bangalore to deliver the first batch of Ather 450s. Currently, the electric scooter – designed and built in India – is available only in Bangalore, and Ather plans to take it to more cities in the months to come. The company’s first electric vehicle is available in two variants – 340 and 450. The 340 variant costs Rs. 1.1 lakhs, on-road Bangalore, and the 450 variant is Rs. 15,000 pricier at Rs. 1.25 lakhs. While the Ather 340 has a real-world battery range of 60 kilometers, the 450 goes 15 kilometers farther with a 75 kilometer range. As for torque outputs, both variants are nearly even, with the 340 producing 20 Nm while the 450 makes 20.5 Nm. From here on, the performance differences are amplified. While the Ather 340 can hit 40 Kmph from standstill in 5.1 seconds, the 450 manages it in just 3.9 seconds. Also, the Ather 450 has a higher top speed of 80 Kmph, compared to the 340’s 70 Kmph. Visually, the less powerful variant gets green alloy wheels and frame while the 450 gets a blacked-out finish for these parts. Other key details including the overall design remain similar though. Both scooters use telescopic front forks and a monoshock rear for suspension, hydraulic disc brakes on both wheels and a battery pack mounted low, in the floorpan. There is a fully digital instrument cluster that gives out a range of information about the scooter, and also has a GPS Navigation option. In short, the Ather 340 and 450 aim to revolutionize electric scooters in India by giving buyers racy looking options with performance to match. 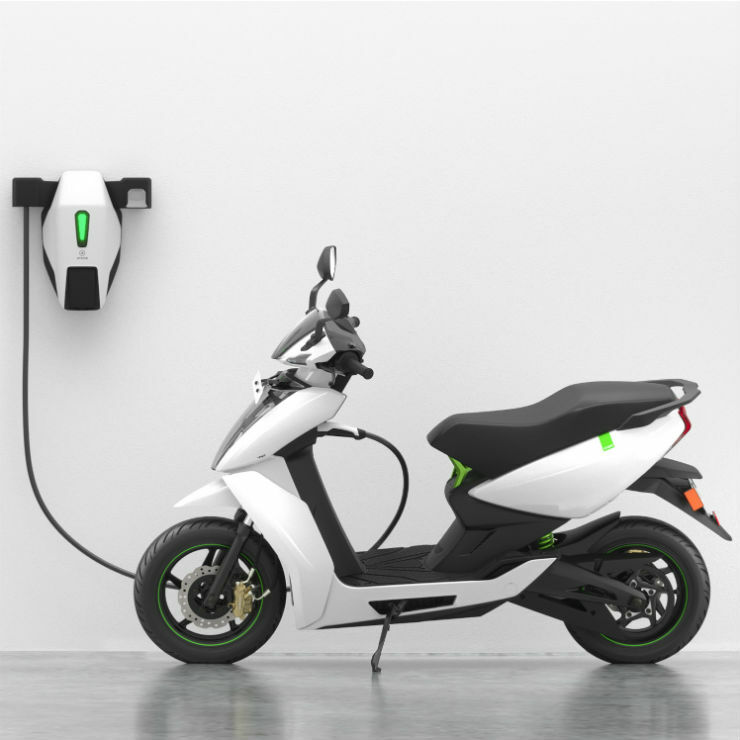 In future, Ather Energy will launch more products in the electric mobility segment including a premium motorcycle. For the next year though, the focus will be on ramping up production of the Ather 340 and 450 twins to reach more customers across the country.